I love Monday mornings. That's because I don't have to go to work until evening. I can sleep until late in the day while the rest of the world is battling the rush hour traffic and wishing they can extend the weekend. This Monday morning is extra special. We got two surprises. Well, Mila did. Hubs and I had been thinking of checking out our local health center to get Mila's vaccinations. I know that most of the vaccines are given free. Come to think about it, we are paying for it with our ridiculous taxes, so why not utilize it, right? But we don't know where our local health center is and we don't even know if they will recognize us as residents in our barangay since we're not registered voters here. Those I know can be solved easily when I ask the right person. If I do and when I do. We had been putting it off and prefers the convenience of going to our pedia in San Juan De Dios. All our consultations are free because Mila has her health card but it does not cover the cost for vaccines and it can cost a lot. It had been in the news that a national campaign against Measles-Rubella and Polio had been launched by the government. Unicef had donated millions of vaccines to be administered for free for all children 1 to 5 years old in local health centers. I wanted Mila to take advantage of that so I told myself that Monday morning will be the day I finally sign Mila up. At 10 am, Yaya Joy woke me up (I mentioned Mondays are for sleeping so don't judge) She said there are doctors looking for Mila and I had a microsecond panic because I thought she said Mila needs to see the doctor. I'm glad I decided to check it out instead of just going back to sleep. It turned out that doctors from our Barangay Clinic are going door-to-door to administer the free vaccine. 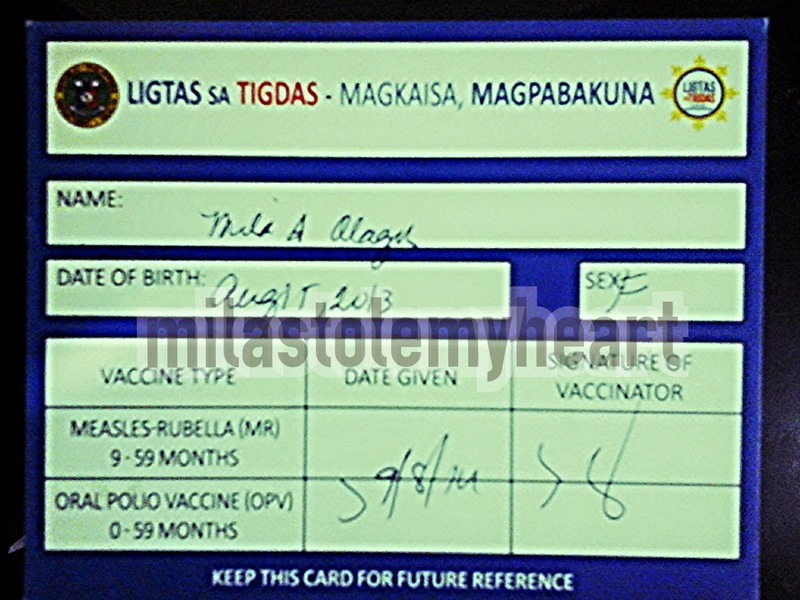 They can only give the Measles-Rubella vaccine if the last dose was more than a month ago. Mila had hers last March so it's a go. Surprisingly, even if I had to force her to wake up, she was not cranky and barely cried when the injection went in her left arm. Then the Polio drops seemed like juice for her. 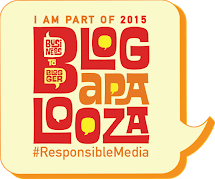 Measles-Rubella P800, FREE. Oral Polio P200, FREE. Helping Mila stay healthy is priceless. The extra shopping money is a bonus. Within a few minutes of waking up, we save at least P1,000. Yey! For the second morning surprise, Mila got her first hand written card. Receiving an air mailed letter is surprising enough, then I'll see it's hand written, and it's for my Mila, totally unexpected. I am jealous. And shamed. 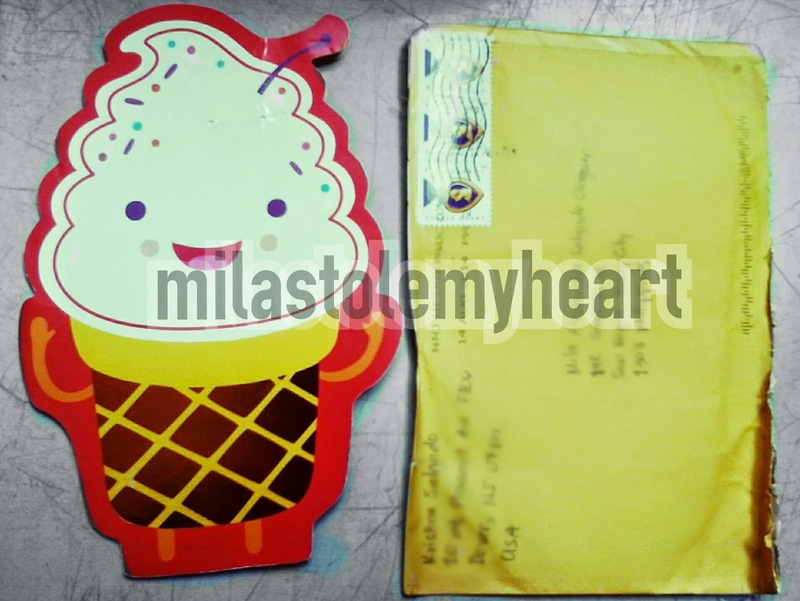 I wrote Mila letters on this blog and even mentioned that I promise to teach her the art of traditional letter writing. Yet I don't have a single paper with my words written on it to give her. Hay, another thing I've been neglecting. 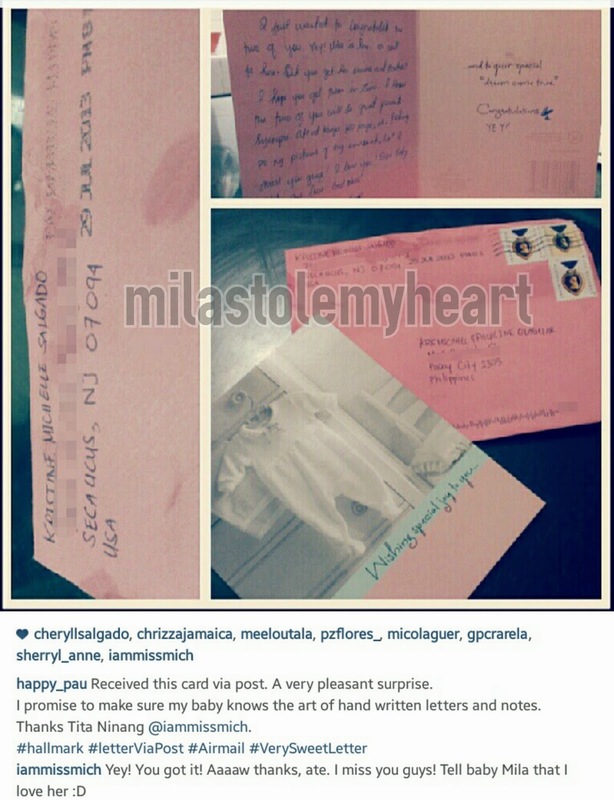 The mail came from Mila's Tita Ninang Mimi who stays in New Jersey. The two had not met yet except through Skype. They adore each other. I love that Mimi continues to send hand written cards and letters to family and friends. She sent us one when Mila was newly born. She also sent a Christmas Card and a Birthday Card to Hubs, her cousin. 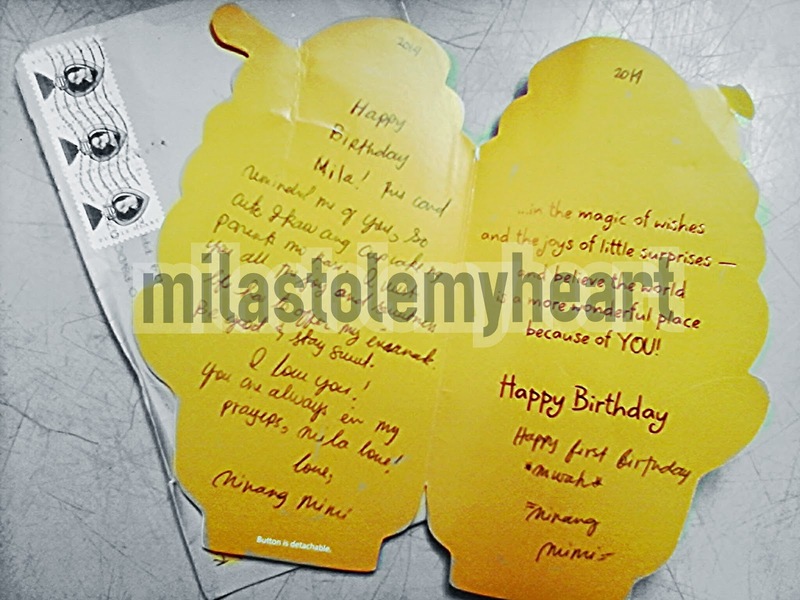 That's when I said I should be teaching Mila to appreciate the love poured over a letter that is personalized by touch. Thanks again Mimi. We love you! The first Air-Mailed letter we received. Mila loved her ice cream cone card. She even read it a few times. And there's a pin that came with the card that she loves to eat too. Yum! Post Mistress. Is that what you call a lady postman? Should it be postwoman? Postlady? Either way, I got my own Monday Morning Surprise from the lady who delivered our mail. Upon entering our gate, she handed me the envelope, then took my chair without asking or being asked. She told me to sign the acknowledgement sheet and before I was done, she said in a voice that's a little demanding: "Hindi mo ba ko bibigyan ng tubig? Kailangan ko uminom ng vitamins ko. Pakisiguro na Mineral Water ha." Wow! I'm glad I have Mila with me and was still on a good mood. I just teased her, "Sosyal naman si ate, mineral water lang iniinom." And she turned condescending "Mineral water lang hindi mo mabili? P35 lang naman yun. Tubig gripo ba iniinom ng baby mo?" She went on her litany about why people do not buy or drink mineral water when it is a necessity. By then, I already decided to leave and just keep my happiness. OMG What is that post mistress about! Demanding ha! Buti di mo pinatulan, I don't think I would've been patient with her. Anyway, our two younger sons had their vaccines at the baranggay. Tiniyaga talaga namin pumila when the lines are long and it was worth it. 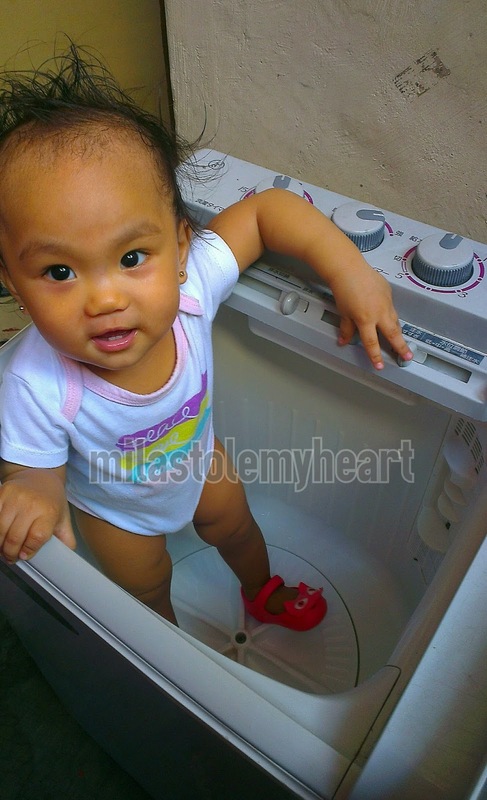 Baby ba't nasa washing machine ka?! Hehehe. Nakakaloka si post-mistress, totally surprising. As for the vaccines, do avail of them talaga. I think I was able to save 15k just by going to the Barangay Center faithfully. Don't worry; I don't think you need to be a registered voter in the area to avail. Just go to the center and tell them that you live in the barangay. Wow on the postal mistress! Napagod siguro nang sobra sobra si ate kaya ganun kasungit and demanding! It's so nice to still receive handwritten notes. I haven't gotten any for a long time now. Buti good mood ka. Ipapaligo ko sa kanya yung mineral water dahil sa emote nya. Kaloka. It's really a happy Monday indeed! Writing a traditional mail is really touching. The effort in writing is nearly gone because of E-mails and Cellphones. I wish I can be that excited during Mondays! Lol! Btw, keep that good mood rolling! What a great start of the week! 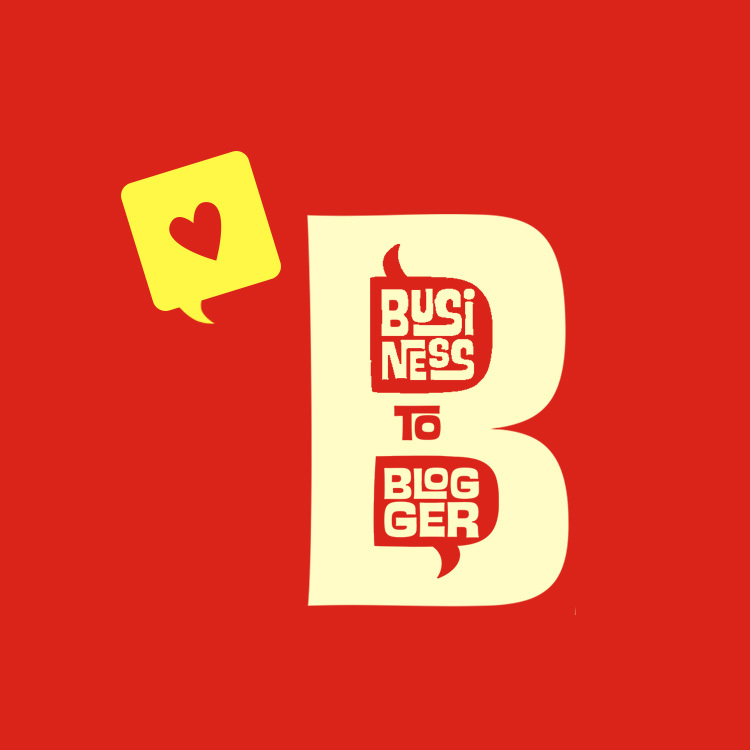 Free vaccines and sweet snail mails! It's truly your Monday, a special one, and you save one thousand pesos. Hubby's happy of course, because you used your right for your beloved baby. That was a great surprises and savings as well. But the post mistress, she surprised you more! haha. But, neglecting it is the best way to stay happy and positive on that Monday morning. I like this small kinds of surprises too!! Yes, do take advantage of the free vaccinations as its part of our taxes. Nakakaloka the lady who delivered your mail! But it's good that you didn't let her ruin your good mood. I also receive hand written cards from an old friend who moved abroad. She sends me letters every once in a while, and I think it's so precious. Such a weird and demanding postwoman. I don't know how I would have reacted to her demands if I were in her shoes. Haha! Anyway, that is such good news about the free vaccines. I should go ask our local health center too. Whoa, what was with the post mistress! LOL. Good thing you didn't let her ruin your mood! I dislike that mail stuff , it takes like forever to arive. Glad that you had free vaccination for your daughter. Vaccines nowadays are really expensive.